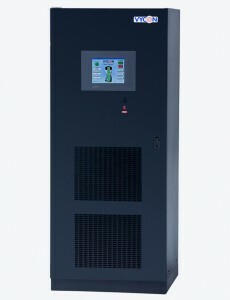 Uninterruptible Power Supplies require a readily-available, reserve power source in order to provide uninterrupted power to a connected load in the event of a facility power outage. Often this source is a battery plant. However, batteries are not the only option available for use with UPS systems. Flywheels are a desirable option for use in lieu of batteries or in parallel with batteries. Hedrick Associates is a distributor of Vycon Flywheel technology by Calnetix, for use with our Liebert UPS systems. We have extensive experience applying flywheel solutions on our UPS systems, and enjoy a sizable installed base of Liebert UPSs paired with flywheel equipment. Flywheels are a reliable, clean and efficient alternative energy source. In comparison to lead acid batteries, flywheels offer an innumerable amount of benefits. First, they eliminate the batteries inevitable flaw of failure. Batteries generate heat, and heat reduces battery life. Lead-acid batter­ies degrade every time they are cycled (used) and one bad cell in the battery bank can take out the others, rendering equipment useless. Moreover, batteries take up a lot of space, require expensive cooling and contain haz­ardous chemicals, making disposal an issue. Flywheels eliminate constant battery replacements, which are needed every 2-3 years. The VYCON® patented technology design requires little maintenance and allows for a 20 year life-span. The VYCON energy storage systems have a small footprint in comparison to batteries, and produce no emissions or carbon dioxide. The VYCON product line is ideal for consumers who have limited space and enables equipment to be used in spaces not typically thought of for electrical equipment. Top data centers, hospitals and manufacturing plants trust VYCON energy storage systems to keep their facilities up and running 24/7. Footprint savings- VYCON units save space that would be taken up by an equivalent power rated battery bank. This lowers construction costs or allows space to be freed up to use more efficiently. Environmentally friendly- VYCON units produce no carbon dioxide or emissions. Lower-life-cycle-costs – The ROI is typically within 3-4 years, and over a 15-20 year operation, the VYCON energy storage system’s total life-cycle is a fraction in comparison to batteries.